The roads here in Louisiana are so much nicer now than they were when Robbie and I first visited twenty years ago. There are people here called “Cajuns” (KAY’ – juns), which means they are part Canadian French. They have an interesting dialect. It’s fun to listen to them talk between themselves. I hear things like “I gar-raan-tee!” which is supposed to indicate that they MEAN it. We have good friends here and they are “wonderful-good” cooks, whether they are just cooking soup or a big crawfish boil. There are a lot of people with the last name ‘Hebert’ , pronounced “A-bear”. The Herberts we know are handsome and dark. One of our favorite restaurants is Pat’s Seafood in Henderson, LA. But we don’t eat there this time because we are nowhere near it and so must keep moving on. The woods along the road are real thick and lush. We are really noticing the absence of camping places. It’s getting on dark now and we do need a place to stay overnight. We see some campers have pulled into rest areas and roadside parks. There is not protection from bandits and such so we don’t understand how people can do it. We’ve got to pull over because Becky noticed the gas tank is open, just as Jeff announced that the gas man left the “door” open. We’ll stay at the Ramada Inn because there are no places to camp. Supper at Don’s Seafood is $18.29 for the five of us including tip. They have great crawfish. Never thought I’d ever eat such a thing but they’re good. A little like shrimp but with a richer flavor. Robbie balanced the load in the trailer better so it won’t sway as much. Jeff announced that Humble Oil is not Enco here but Esso. He is so smart for seven years old. Filled the tank in the afternoon near Baton Rouge. 16.5 gallons for $7.10. Seems high. We pulled into a roadside park to eat some snacks and stretch legs. The roadside parks here are not as nice as the Texas ones. 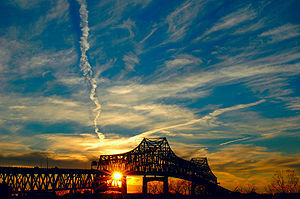 Baton Rouge has a high bridge over the Mississippi River. Industry on one side and woods on the other. We turn to go directly to New Orleans and the highway here is awful. So bumpy. I suppose since they are working on the new Interstate 10 that they haven’t paid much attention to this old road. We arrive in New Orleans just as the five o’clock traffic is homeward bound. I notice a pelican on the bridge in Gretna, La. It is supper time so we pulled into a place called Buck 49. Jon’s shrimp is better than Christy’s. My catfish is too strong. We take the tunnel at Belle Chaise. We arrived at Vernon Schlief’s and they had a surprise – An apartment for us to stay in – very nice two bedroom with air conditioning. We went to the French Market. On the way there we saw about four fender-bender type accidents. At the quarter we had plenty to do: Perfume shop, souvenir shops, coffee shops, creole lunch. Jackson’s Square. The Schliefs said there would be a lot of hippies there (almost part of the must-see tourist view) but we didn’t see that many. Those we did see looked miserably hot and uncomfortable. Probably all that hair. The Schliefs told us if they weren’t there it was because they were on Bourbon St where there has been many robberies and murders done by them. The souvenirs and curios are so pretty to look at but much too expensive. Took in the Wildlife Museum in the French Quarter. The day’s total came to $32. We drove back to the Schlief’s before the five o’clock mess that we got into yesterday. The Schleifs are famous for their hospitality and it is true. They keep the apartments for missionaries that need a place to stay. They fed us well and wouldn’t let us pay for the apartment stay. Up early but didn’t leave until 10:45. These kids are slow as pudding in a sieve. Drove over the Mississippi bridge and saw no accidents. On the other side we pulled into pastry shop and got jelly donuts, fried pies, and a soft loaf of bread while R cashed a $20 traveler’s check. Took the Interstate 10 truck route up onto the big highway. As we drove we saw a group of wild-haired, dirty hippies thumbing a ride. No one would pick them up, surely. At 12:25 we entered Mississippi. No comment from the kids as they were all asleep. The #59 freeway is long and smooth so far, but I have seen no rest stops or Howard Johnson’s. There aren’t even a lot of filling stations. I hope we make it on what little gas we have. About four miles this side of Hattiesburg there is a little rest stop but it didn’t look like much so we kept on driving. Robbie only had one cup of coffee this morning so he sure is yawning. Hope we make it. Hattiesburg, Mississippi. Bought 13.8 gallons for $5.65, and some lunch stuff so we could eat driving along. We turned off the good highway through Pachuta to Quitman to Clarke County State Park. Between Pachuta and Quitman the winding road was bound on both sides with ruts of deep red/orange dirt. The state park is primitive with a pretty lake with no place to boat or swim close to the camp grounds. Drove to Meridian, Mississippi. 4:15 PM Stopped at the only campground in the area. Private so it cost a dollar to stay. The restrooms are filthy. The camping area is noisy and dusty as it is very near the highway. We were able to pop the camper up and get set up to cook some supper on the camp stove. We kept a little fresh meat on the ice in the box and knew we’d have to cook it soon. The box drains the melted ice away and we saw it wasn’t draining much. Cooked the steaks. So good though a little gritty with all the dust. Beans from a can. It was enough. Settled in for our first night in the camper. I was awake as people were walking their dogs until at least 12 and the big trucks were blasting past us all night. Packed up and left at 7:45. We ate a good breakfast at the Howard Johnson’s. Mileage 52,227.0 Meridian Mississippi 13.3 gallons for $5.70. By 10 AM we were in Alabama on a two lane highway, which was very bumpy all the way to Tuscaloosa. An interesting thing about Mississippi – We noticed an absence of colored drivers or of colored people anywhere. Now in Alabama they are everywhere. They tend to drive very slow on the busy highway where the speed limit is 70. This means sometimes we are in a long line of cars behind a slow car like that. It really is nerve-wrecking. I wouldn’t have thought anything of the lack of colored people in Mississippi except that once in Livingston, Alabama we got stuck behind a slow-moving car. I had a chance to take in all the well-manicured lawns and houses and saw the colored people tending them. We never had any help growing up or since but I do think a nice, neat home like what we see here is a thing of beauty and a joy forever.